Truly breathtaking choreography and magnificent dance talent. I love a bit of movement and I have to say it is quite a treat when I get the opportunity to see a full dance show. I was most excited to see Rasta Thomas’ and Adrienne Canterna’s Romeo and Juliet, which was billing itself as “ballet with a 21st Century twist.” Cool. On perusing the programme I was excited and intrigued by the Baroque and 21st century music mash up; I mean who doesn't like a side of Jay Z or My Chemical Romance with their Vivaldi? I for one love a bit of fusion! After a technical hitch, the show started with a fair punch as we witnessed a dance fight between the Montagues and the Capulets, set in a bar to Run DMC’s "Walk This Way." I have to say it was immediately obvious that I was watching some serious dance talent – the Bad Boys of Dance lived up to their name. It was a true delight to watch the athletic and powerful yet graceful male dancers combine traditional forms of ballet with a modern kick; I was both impressed and enticed by their performances which added a new level of physical brutality to one of the most tragic love stories of all time. Ryan Carlson as Tybalt, Jarvis McKinley as Mercutio and Preston Swovelin as Romeo were all particularly impressive. Sadly only two females remained in Thomas’ and Canterna’s Romeo and Juliet; the Nurse and Juliet (played by Canterna herself) thus axing the usually engaging dynamic between Juliet and her mother. Nonetheless the ladies were charismatic throughout and Canterna certainly wowed as the besotted teen. Whilst Canterna’s passion for the piece is obvious in her choreography throughout the show, she radiated the aching love of Juliet to perfection. Okay, so the dancers were magnificent and that really is half the battle won, however there was one key issue with the piece for me; the concept. As I mentioned I love the idea of a juxtaposition of eras and if done well then this could have been seriously interesting however in this case it rendered the show a bit of a confused mish-mash. The piece claims to have a “21st Century Twist” but, whilst there is certainly a few key 21st century songs played, there are also pieces from the 1960’s (The Righteous Brother’s “Unchanined Melody”) and the 1980’s (The Police “Every Breath You Take.”) the 1990s (Des’Ree’s “Kissing You”.) Similarly I am not too sure what the “modern” (do we still count the 60’s as modern?) music is juxtaposing with – the classical music ranges from the 1600’s (Vivaldi) to the mid 1900’s (Prokofiev.) I feel the show would have worked better if it was just contrasting two very specific eras rather than detailing several in a jumbled two hours. The above is perhaps THE fundamental issue which led to several smaller but related problems; costume choices were very odd and at times looked very out of place and the much anticipated video projections were not great. For example one moment we were on a beach, the next on a grand Renaissance staircase, the next in a Renaissance bedroom adorned by swirling hearts and lipsticks and the next we were in some kind of traditional karate hall. Sure. But..what?! Lastly, as I say I really do think the juxtaposition of eras would have worked well, but unfortunately in this production they did not transition with any success. Vivaldi would abrubtly end (what happened to subtle fade outs) and Usher would pipe up with little attempt at a blend. This rendered the piece even more disjointed than its miscellaneous concept. Hm. I cannot stress enough how magnificent the performers were, I really can’t. I just felt that I was watching an expert show set to a completely random backdrop with some strange clothing choices. If you love dance as an art then you will love what Adrienne Caterna has done with the movement of the piece. Her production of Romeo and Juliet is worth a watch for the talent alone. 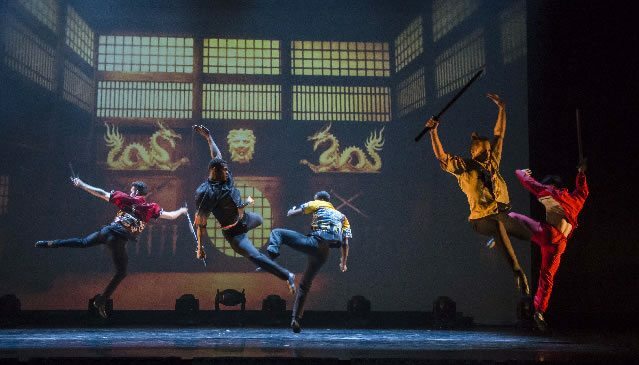 4 March 2015 - Truly breathtaking choreography and magnificent dance talent.